Professor, Department of Philosophy, Tsinghua University, Beijing. Member of “221 Program for Foundational Researchers”, Tsinghua University, Beijing. UvA-China Logic Chair, ILLC, University of Amsterdam. Editor-in-Chief of Logic in Asia: Studia Logica Library. 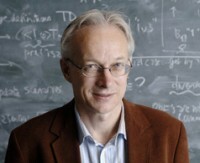 University Professor of pure and applied logic, University of Amsterdam. Henry Waldgrave Stuart Professor of philosophy, Stanford University. Changjiang Professor, Chinese Ministry of Education, Tsinghua University, Beijing. Member of the Royal Dutch Academy of Arts and Sciences (KNAW), the Academia Europaea (AE), and the Institut International de Philosophie (IIP). Address: Xinzhai (新斋) 124, Tsinghua University, Beijing, 100084, China.